I really love the idea that you can get things from a Dollar Store cheaper and you can use it for DIY projects, home decor, and even organization. It can totally bring a stylish and awesome feel to your home without spending a bundle. So I’ve found some awesome and easy Dollar Store DIY projects from around the net and provided links so you guys can see the best hacks around. So check them out and let me know which one is your favorite. You have probably seen a lot of vases at the dollar store. Why not get one and make a beautiful enamel painted vase on your own. You’ll have fun while doing this. The dull and boring accordion racks can get a totally different look if you decorate them with marble contact paper. This is super easy and can make your entryway feel a little more luxurious without spending too much. I really love these cute and adorable Dollar Store DIY projects. It’s cheap, super easy but definitely looks amazing. They’ll also definitely get likes on Instagram. Instead of buying an artificial topiary tree why not create one. You can make your own using dollar store supplies and it’s more inexpensive. Repurpose your clothespin into colorful trivets that will give your dining table a fancy and fab look. Place your skillets on top and dinner is ready. Serve hot and delicious meal for the family. Who’d have thought that a metallic gold paint pen you can have a Kate Spade inspired rose bowl? It really looks chic, stylish and elegant – perfect for a centerpiece. With just a few minutes, you can create a nifty and stylish mouse pad. Much cheaper and better than the store-bought mouse pad, don’t you think? 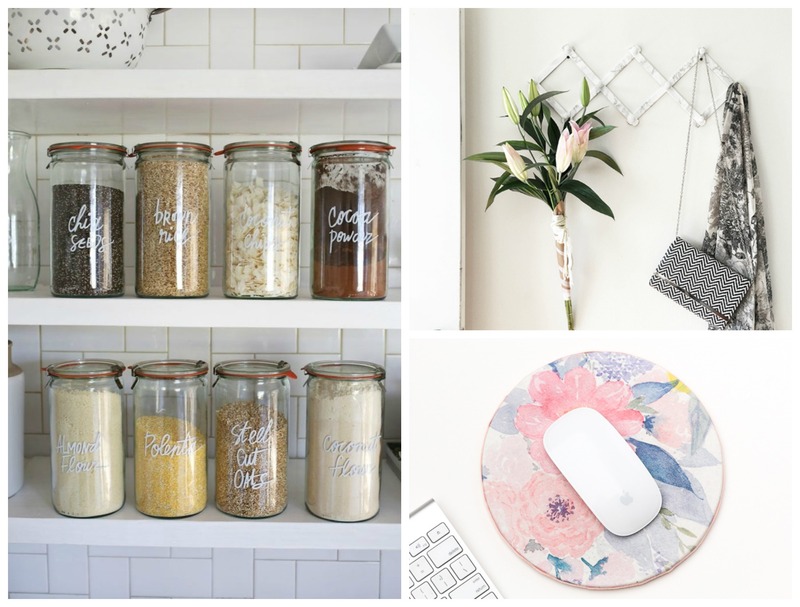 If you’re looking to organize your kitchen, look no further! You’ll only need a paint pen with your preferred color and voila, things just got cute and organized! There’s no doubt that there’s a lot of things the Dollar Store can offer. Whether you’re just planning to decorate your home or add some extra accents, you’ll definitely get what you want. And these are all seriously easy and super cheap. So consider these tips to your next Dollar Store visit and let me know what you think! Great roundup. I love finding old picture frames, spray painting them, and using them as decor. I was wondering if you guys knew a company that can do ads on my blog, but I would like to have the option to chose the ads before they appear on my website and a company from which I can earn money every time someone clicks on the ad obviously. I know there’s google adsense but I cannot chose the ads that appear therefore I don’t want their program. If you know any can you please tell me the name and if I need a certain number of views per day on my blog to be able to join their company? Hey Sabrina! We’re with MediaVine right now and they’ve been great.